Joanne Sher: Editor/Proofreader : Old or New? Our society, it seems, is obsessed with new. We need the newest gadget. We're always striving for the next big thing. We prefer bright and shiny to well-worn. But a lot can be said for the old - the tried and true. 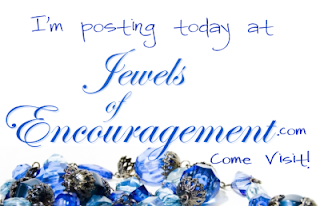 Join me at Jewels of Encouragement today, as I talk about the one old thing - Ancient, actually - that is infinitely better than anything fresh off the assembly line. Come with me and follow the Old-Fashioned Paths. You won't be sorry. Can men living in the 21st century steal the thief's plan of salvation and be saved? No they cannot. The thief was the one and only person saved by his plan. What did the thief do to be saved? What was not in the thief's plan of salvation? 1. The thief did not believe in his heart that Jesus was raised from the dead by God the Father. (Romans 10:9 that if you confess with they mouth Jesus as Lord, and believe in your heart that God raised Him from the dead , you will be saved;) The thief could not believe that God raised Jesus from the dead; because Jesus was sill alive when the he was saved. THE THIEF DIED UNDER THE OLD COVENANT AND GOT A DIRECT PARDON FROM JESUS. Men living today can only be save by the terms of pardon under the New Covenant. The terms of pardon are: FAITH John 3:16---REPENTANCE Acts 2:38---CONFESSION Romans 10:9-10---WATER BAPTISM Acts 2:38, 1 Peter 3:21, Mark 16:16. PEOPLE OF THE 21 CENTURY CANNOT STEAL THE THIEF'S PLAN OF SALVATION AND BE SAVED!